Lucy noticed that her nails did not look as good as they had before she started surfing. They had a lot more white spots than before. Was she sick? Her friend Tammy always said that nails were an indicator of good health. Maybe she had a vitamin or mineral deficiency? Did she need see a doctor? To some extent, Lucy’s friend was right. Strong, healthy fingernails can be a sign of good health. But Lucy shouldn’t get too worried. Some changes in the color or appearance of nails are not signals of a health issue. Some common nail conditions are harmless. What nail conditions are harmless? Brittleness: This is weakness that causes nails to break easily. Often this can be caused by something as simple as frequent immersion in soapy water or the nails becoming overly dry. Like dry skin it can get worse during the winter. Vertical ridges: Vertical ridges are quite common and can become more pronounced with age. White spots: White spots are usually the result of a minor injury to the nail, not of a vitamin or mineral deficiency. They will disappear as the nail grows out. However, other nail conditions, such as yellow discoloration, separation of a nail from the nail bed or indentations that run across the nails could indicate a health problem. So, if you notice any persistent change in the texture, shape or color of your nail it is probably time to seek medical advice. However, the doctor won’t be able to diagnose solely by looking at your nails, he/she will have to run other tests to determine exactly what is going on. How can keep I my nails healthy? If you want your nails to be healthy and look their best, you can’t neglect or abuse them. Here are 7 basic tips to keep your nails healthy. Maintain your nails: Perform routine nail maintenance. Trim your fingernails and clean under the nails on a regular basis. When you do, use the appropriate device, such as sharp manicure scissors or clippers and an emery board to smooth any sharp edges. Wear gloves: To prevent brittleness, wear rubber gloves when washing dishes or using harsh chemicals, such as when cleaning. And wear warm gloves when going outside during the winter. Don’t bite your nails: Over time, nail biting damages the nail bed (the skin beneath the nail). Don’t pick or remove cuticles: That can allow bacteria or fungi to enter, possibly leading to infection. Don’t pull off hangnails: Hangnails are the small strips of skin that peel away from the cuticle. They can be painful, especially when they get caught on stuff. They are usually the result of dry skin or nail biting. So, use a good hand lotion around the cuticle daily and avoid nail biting to prevent hangnails. And if you get them, cut off the loose skin with manicured scissors. Tearing them off can lead to more hangnails, more pain and possibly infection. Moisturize your nails: Like skin, nails can get dry, so it is important to moisturize both nails and cuticles on a regular basis. Limit use of nail polish remover: Nail polish remover is very drying to nails and cuticles and should be used as sparingly and infrequently as possible. Try not to remove nail polish daily. Instead make repairs by applying more nail polish. Avoid certain nail hardeners: Avoid nail hardeners that contain toluene-sulfonamide formaldehyde resin. This chemical can produce a rash on the fingers or around the eyes. Look for a hypoallergenic enamel that is free of this chemical instead. Not all nail conditions are a sign of illness. Some are actually harmless, but with good nail care you can keep your nails looking their best. 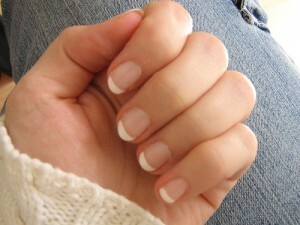 So, spend a little time taking care of your nails and you will reap the rewards of strong, healthy looking nails! I agree with you. I always make sure that I take very good care of my nails. I always use gloves when cleaning anything. Fingernails are a very good indication of what is going on in the body! People neglect the warning signs that the body will give them. Waiting until your nails become brittle, start breaking off of even becoming yellowish in color usually mean you have waited too longer. Even men need to make sure the proper precautions are taken in consideration.